1. The connection between the hammer head and the handle must be firm. 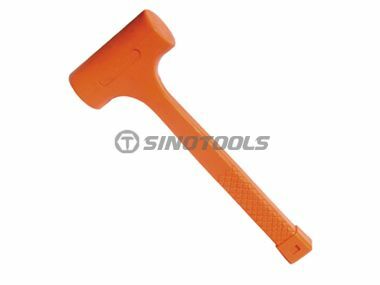 If the hammer head and the hammer handle are loose, the hammer handle has cracks and cracks and must not be used. The wedge of the hammer head and the hammer handle are added to the mounting hole, and the metal wedge is preferred. The length of the wedge is not more than 2/3 of the depth of the mounting hole. 2. In order to have a certain elasticity when hitting, the middle of the handle is slightly narrower than the end. 3. When using a sledgehammer, you must pay attention to the front, back, left and right, up and down. It is strictly forbidden to stand in the range of sledgehammer movement. It is forbidden to use the sledgehammer and the small hammer to play each other. 4. The hammerhead is not allowed to be quenched. Cracks and burrs are not allowed. It is found that the flashing of the flashing edge should be repaired in time. In fact, we are aslo Caulking Guns Manufacturer and Grinding Wheel Exporters. If you have demand about our products, welcome to contact us. Next: The Quality Problem of the Grinding Wheel Has Such A Big Hazard!